After any concert by Taka Kigawa, one feels a sense of rare elation. Other young pianists may be equally brilliant, technically as adept. But Mr. Kigawa has an extraordinary affinity with music which is anything but ordinary. Whether he plays two hours of Bach or two hours of Cage, one never feels that he finds it urgent to perform, or that he is experimenting. Rather, there a molecular attraction between the music and the performer. At Le Poisson Rouge, where I first heard him playing Stockhausen several years ago, he performed two composers unknown to me last night. One Zasha di Castri, had composed in a musical language so abstruse in structure and harmony, that I could make no sense on first hearing. Mr. Kigawa plowed ahead, like an ancient-language linguist, successfully decoding the glyphs on a shard without knowing the language. The experience was its own reward. His second work, Joule by Dai Fujikura, was equally complex, but the title gave it away. Mr. Fujikura was dealing with a measurement of energy, and his energetic excesses made a lot more sense. For half the time, this was the most forward jazz, taking Thelonius Monk into the 21st Century, pointed polyrhythms, syncopations which suddenly stop, taking Mr. Kigawa’s fingers to the furthest registers of the keyboard. Once again, this energy between piano and piano-player was without any space in between, a kind of String Theory permanent vibration. This was not a solo recital. 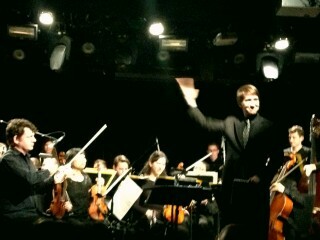 Like Prince Esterházy and King Frederic II, Le Poisson Rouge now has its own “house orchestra”. And while Ensemble LPR may be a pickup ensemble, their pickups are among some fine New York virtuosi. Their conductor last night, Oliver Hagen, new to me, opened the Varèse Octandre with a good punctuated performance. Sitting up close in Le Poisson Rouge, one realizes how shattering all those squeaks, grunts and barks could be. This was no concert hall with space between players and audience ears. We really did feel the vibes. The following Gallery Music by the splendid conductor Brad Lubman, could be (and maybe was) like Saties’s Furniture Music, as boring and uneventful as music could be. I did want to read my book during the performance, but thought maybe something would “happen.” It never did. Now onto the longest and essential part of the program: Ligeti’s Piano Concerto, a work he himself considered his most technically complex work, with virtually unplayable music. Yet all five movements–four of them very fast–were played with dazzling assuredness. That first movement was a study in unsteadiness. The piano music is written in simultaneous different scales for different hands. We had plenty of simultaneous for both piano and orchestra and constant rhythm changing. Ligeti, though, was not your usual European composer. He was Hungarian, and those Bartók-style nature sounds came out in the second “Desolate” movement, beginning slowly, ending with shrill calls. For the final three movements, Mr. Kigawa led the orchestra a merry chase, especially in the Stravinsky-like finale Stravinsky, though, held back from this organized chaos: Ligeti let it go, with both orchestra and pianist holding a carnival of music. The cohesion wasn’t structural or harmonic. It was a kind of quantum cohesion, space and time vying, fighting, bouncing off each other. Unfairly, but inevitably, I had to compare Taka Kigawa with the more publicized pianist I had heard the night before, Simone Dinnerstein. Ms. Dinnerstein gave a credible performance, and was suitably respectful of the two composers of our own century. Mr.Kigawa gave an incredible performance, not “respectful of” but actually part of his composers, with nothing between him and his fingers. I was trying to think of an analogy, and remembered an interview I had once with Toshiro Mifune. He spoke in mainly monotones, until I asked whether he was spiritual. He stopped and then spoke non-stop for five minutes. The translator said, “Mr. Mifune said that his spirituality was limited with his director, Kurosawa. 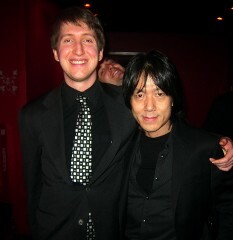 One feels that same communion between music and Taka Kigawa.